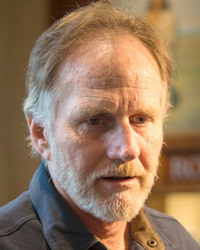 Carl Sander is a playwright, actor, producer, stage and production manager whose work in the Seattle Theater community spans thirty-five years. In that time he earned an MFA from The University of Washington School of Drama, served as a Washington State Artist in Residence, and received grants from the Washington, King County, and Seattle Arts Commissions. His plays have been produced by the Seattle Repertory Theater, A Contemporary Theater, and The Seattle Children's Theater and many others. He toured internationally as a playwright with the Seattle Peace Theater, creating new works with artists from around the world. Perfect Stranger runner up in the 1999 Richard Hugo House New Play Competition. Produced by One World Theatre at the Speakeasy Backroom October 2000. Navy Brat for the Seattle Repertory Theater Mob Tour. Standing Up Walking Out based on interviews and observation surrounding the Nord Door Strike in Everett, WA. Toured Union Halls throughout Washington. Two Women TV winner of the first ever New City Theater Playwrights Festival. American Lebanon winner Stanley Kramer New Play Contest. Duffy Don't Do Dead Singers No More for A Contemporary Theater's Songworks Project. Adventures In The Alley Of Extraordinary Obsession and Adventures In The Archive Of Truth and Dare for Seattle Children's Theater Young Actor Training Program. The String Cycle a Tavern Opera in Three Acts, produced at the Eastlake Zoo and presented at The Backstage and Bumbershoot. Responsible for coordination, budgeting, and promotion of annual events, exhibit openings, ongoing exhibit programs and special events for the oldest museum in Washington State. Oversight of, staffing, budget, installation and tear down of all ground activities, discovery centers, production offices, fundraisers, and galas, for this weeklong annual festival on the Seattle Center grounds. SICF is now in its twentieth year and serves over 30,000 Washington children music, dance, and theatre from around the world. Responsible for all aspects of production including lighting, stage management and crew supervision, for this Native Alaskan theater company as it toured the US. playing venues ranging from the Lincoln Center and The Smithsonian, to high school auditoriums and community centers. Coordinated all production for Theater Zero (the resident Equity theater company) and produced the annual playwrights festival presenting upwards of forty original plays in three weeks. In charge of generating and scheduling rentals for three performance spaces. Responsible for all aspects of theater production including publicity, production management, stage management, sound and light design, ticket sales, budgeting and accounting for seven productions. Coordinated space rentals for independent productions, workshops and rehearsals.